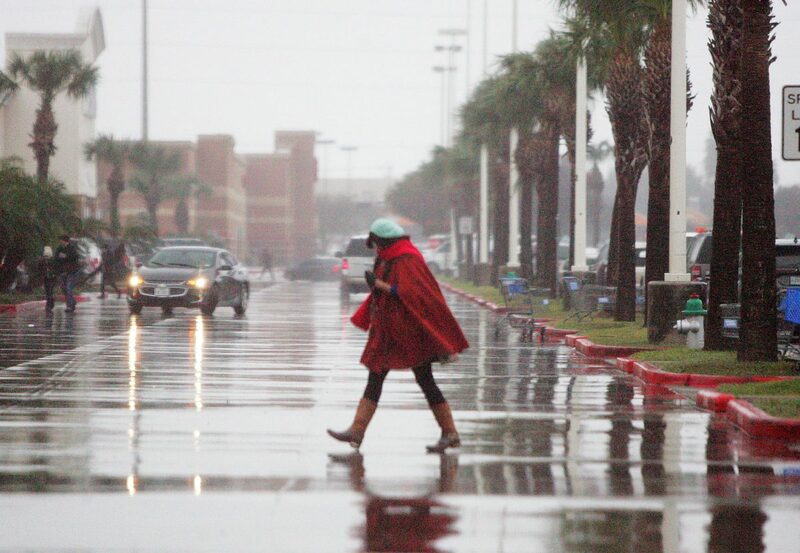 A utility man works in the cold driven rain as temperatures dip into the low 30's Tuesday, Jan 1, 2018, in Edinburg. Power outages continued Tuesday evening, leaving about 1,000 people across the Rio Grande Valley without electricity in the middle of a cold snap. 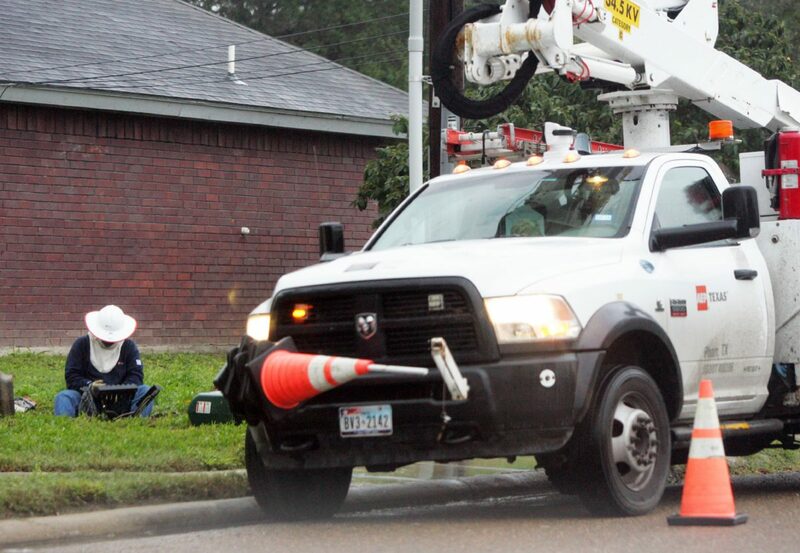 Lee Jones, a spokesman for AEP Texas, said crews continued to work to restore power around the clock. He urged customers to take conservation measures as most of the outages stemmed from equipment overloads. The cold weather also continued to play havoc with electric equipment, resulting in blown fuses, tripped breakers and other equipment failures. 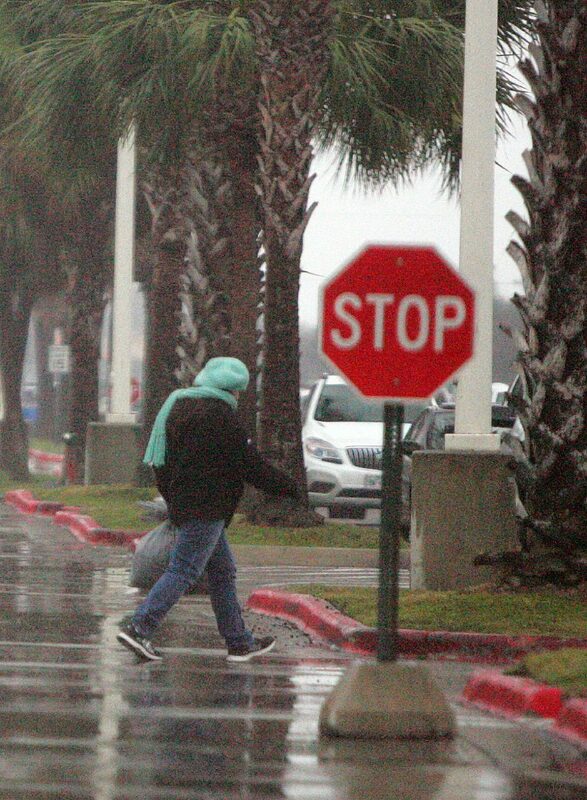 Pedestrians walk in the cold driven rain as temperatures dip into the low 30's Tuesday, Jan 1, 2018, in McAllen. The number of residents without electricity fluctuated throughout the day, but Jones estimated about 1,000 people would continue to be affected throughout the evening. By 8 p.m. Tuesday, most of the outages were centered around the Edinburg and Harlingen areas, according to information found on AEPTexas.com. Jones urged customers to sign up for outage alerts on the website. The alerts are meant to keep customers up to date on developments, including when power is estimated to be restored. Customers who are still without power or lose power are asked to switch off their large appliances, such as the heating and a/c systems, dishwashers, washing machines and dryers. Taking this action will reduce the possibility that breakers will trip again as power is restored to groups of customers in the current cold weather.